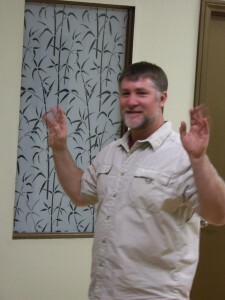 Qigong is a strange-sounding, oddly pronounced word that simply means training your body to work better. Qigong trains you to be natural, at ease and empowered in your own body. 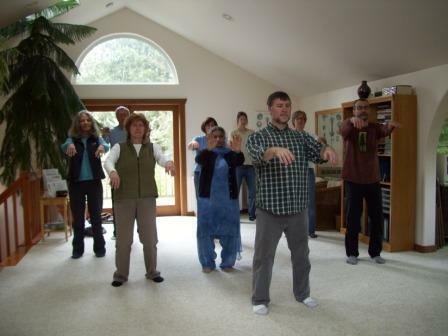 Qigong trains your body to work better from the inside out. This happens not through some mystical process, but by natural means. By incrementally improving how you move, stand, breathe, and think, you change how your body works for the better. A lot better. For instance, by learning how to put or allow just a little bit more distance between your bones, you create more space in your joints. This is like opening doors and windows in your home after a long winter (like the current one that is hanging on) to let in a fresh, enlivening Spring breeze. It clears and renews. Stale air is replaced. This is like riding on air instead of crunching gears. Opening your joints just a little gives more room for movement in each joint and the articular system of the whole body. It is like putting cushions between your bones. You are more comfortable in your body when less compacted. You acquire more capacity to take stress. Synovial fluid of the joints can clear out stuck gunk. Joint tissue healing that might have been stalled can restart. With less energy of the body being used to deal with the compacted joints, more is available for other processes. Maybe some chronic joint pain clears up, which is great in itself, and frees more energy yet. You will probably also breathe easier because your are less tense and rigid. This means you are clearing more gunk and junk out of your body and absorbing more oxygen, which gives you still more energy. Can you get a sense of how you now have more “Qi”? Creating space between your joints is just one of many powerful, principles that is cultivated in Qigong practice. Learning and using that one principle of opening the joints can help you feel and be happier, healthier and more relaxed. I will write more about the specificities of joint-opening in a later post.